DNS uses a holistic approach to rehab to “train the brain” to maintain central control, joint stability and ideal quality of movement that is achieved through guidance from your Practitioner. What is Dynamic Neuromuscular Stabilization® (DNS)? Dynamic Neuromuscular Stabilization® (DNS) is a manual and rehabilitative approach to optimize movement based upon the principle that development of human motor function in early childhood is genetically pre‐determined and follows a predictable pattern (developmental kinesiology). These motor patterns or programs are formed as the central nervous system matures; enabling the infant to control posture, achieve erect posture against gravity, and to move purposefully through muscular activity. Understanding developmental kinesiology provides a framework to appreciate the regional interdependence and the inter‐linking of the skeleton, joints and muscles during movement and the importance of training both the dynamic and stabilizing function of muscles. The DNS® approach provides functional tools to assess and activate the intrinsic spinal stabilizers in order to optimize the movement system for both pre‐habilitation and rehabilitation of injuries and performance. Core stability is necessary for optimal performance and it is not achieved purely by adequate strength of abdominals, spinal extensors, gluteals or any other musculature; rather, core stabilization is accomplished through precise coordination of these muscles and intra‐abdominal pressure regulation by the CNS. The basis for the theories that are included in Developmental Kinesiology (DK) is that development of human motor function in early childhood is genetically pre‐determined and follows a predictable pattern. These motor patterns or programs are formed as the central nervous system (CNS) matures, enabling the infant to control posture, achieve erect posture against gravity, and to move purposefully via muscular activity. DK emphasizes the existence of central movement patterns that are inborn and “hard‐wired”. For example, an infant does not need to be taught when and how to lift its head up, grasp a toy, roll over, creep, or crawl. All these movement patterns or muscular synergies occur automatically in a specific developmental sequence throughout the course of CNS maturation. There is also a strong synchrony between CNS maturation and structural or anatomical development of bones, muscles, and other soft tissues. In short, maturation of the brain influences development of motor patterns, which in turn, influences structural development. This relationship is very apparent in the presence of a CNS lesion (for example, a patient with cerebral palsy), where this developmental synchrony and muscle coordination are adversely affected. The disturbed muscle coordination, soft tissue, and joint development subsequently alters joint position, morphological development, and ultimately, the entire posture. During early postural development, the diaphragm functions primarily as a respiratory muscle. With continued CNS maturation and development to about 4½ months of age, sagittal stabilization of the spine, pelvis, and chest is fully established for subsequent movements that occur in the transverse plane, (e.g rolling, turning, creeping, crawling) and eventually the transition to upright posture. 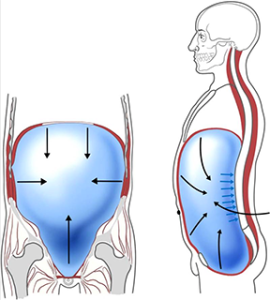 The diaphragm begins to fulfill its dual function as both a respiratory and postural muscle when abdominal breathing is coordinated with chest breathing at about 6 months of age; this results in intra-abdominal pressure regulation (IAP), which helps create core stability. The dual role of the diaphragm is essential for spinal stability and all resultant movements, especially for the complex tasks that comprise athletic performance. This is why the root of DNS rehab starts with breathing. The DNS treatment approach is based on careful assessment of the quality of stabilization and/or movement with the goal of restoring spinal stability via specific functional exercises based on developmental kinesiological positions exhibited by a healthy baby. These exercises should activate the optimal patterns necessary for stabilization (support) in the closed kinetic chain (eg – crawling), as well as the dynamic movements in the open kinetic chain, which occur during reaching, throwing, stepping forward, or kicking. Ensure that all joints are well centered throughout the movement. Resistance or load should be matched to the athlete's ability to maintain proper form during the exercise or drills. The ultimate strategy is to “train the brain” to maintain central control, joint stability, and ideal quality of movement that is achieved through guidance from the clinician. Eventually, through repetition of the exercises, the central control establishes an automatic model that becomes a fundamental part of everyday movement and skills. Integration of an ideal pattern of stabilization in sport activities would not only reduce the risk of injuries and secondary pain syndromes resulting from overloading, but may also improve sport performance.